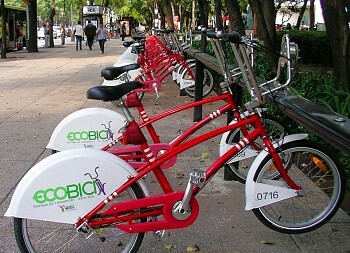 Mexico City’s Ecobici system for public bike rentals in and around the city’s historical center celebrated its fourth birthday in February 2014. The system, established in 2010, currently has more than 60,000 24,000 registered users; between them they have already surpassed 13.5 million short trips by Ecobici. City officials calculate that the system has saved 499 metric tons of CO2 since 2010. Annual membership currently costs 400 pesos (about 31 dollars). It is also possible to buy membership for a single day (90 pesos), three days or by the week. The system is intended for short trips. With membership, the first 45 minutes of each ride is free. There are 275 Ecobici cycle stations and 4,000 Ecobici bikes in circulation. The current level of usage is 25,000 trips each day. The average trip distance per ride is 8 kilometers (5 miles), the average trip time is 20-25 minutes; 80% of users are male, and the average ride saves 7.5 kg of atmospheric emissions. Four out of five riders start or end their trip with a ride by bus, taxi, car or metro. City authorities intend to add Ecobici to the Tarjeta Ciudad travel card that can be used to pay for other forms of city transport including the Metro and Metrobús networks. Criticisms of Ecobici have been relatively minor. Initially, some riders complained that the cycle racks were sometimes completely full, meaning they had to cycle to an alternative cycle station where there was space to leave their bike, or that a cycle rack had no bikes to rent, in which case they had the inconvenience of finding another cycle station that did have bikes. Ecobici’s organizers regarded these issues as normal “teething problems” for any system of this scale, and this sort of complaint is now unusual. Authorities hope to implement a system at some point in the future which allows users to receive, via cell phone, real-time information about where bikes are available. Other road users have complained that some of the Ecobici riders ignore traffic rules by, for example, cycling the wrong way down one-way streets, increasing the chance of an accident. The city government is now expanding the system by 14 square kilometers into the Benito Juárez district, where 171 new bike stations will be located in 22 neighborhoods, including Del Valle and Narvarte. The new cycle stations being installed allow allow casual users and tourists to pay for each individual trip by credit card.